Biology forest honey 500 gr. Plattner bee's court South Tyrol 10,45 EUR / 20,90 €/kg. Forest honey 500 gr. - Plattner bee's court South Tyrol 11,30 EUR / 22,60 €/kg. Lime honey 500 gr. - Plattner bee's court South Tyrol 9,25 EUR / 18,50 €/kg. Acacia honey 500 gr. - Plattner bee's court South Tyrol 13,15 EUR / 26,30 €/kg. Sunflower honey 500 gr. 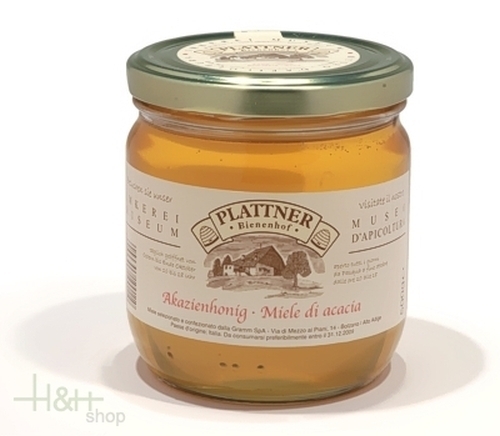 - Plattner bee's court South Tyrol 9,05 EUR / 1,81 €/100 gr.